If the name Peter Robbins is not a familiar one, give the record a listen and then see if you recognize his voice. It was that voice – or at least the part it played in my childhood – that made me chase this record down. 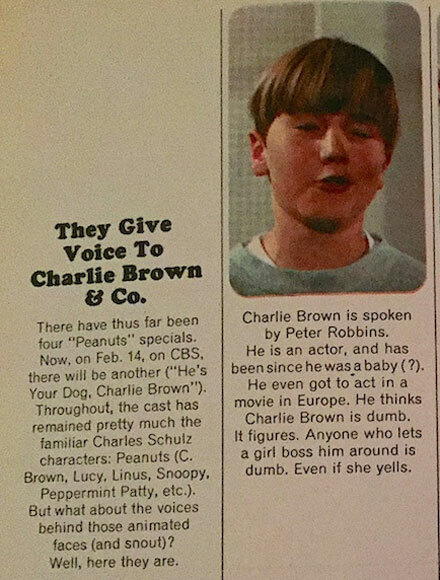 Peter Robbins got his start as a child actor/voice actor in the 1960s, and was the voice of none other than Charlie Brown in ‘A Charlie Brown Christmas’, a number of other late 60s Peanuts specials and one of my all-time favorite movies ‘A Boy Named Charlie Brown’ (the one where he goes to NYC to compete in the spelling bee). When I started digging for info about him, I discovered that he had done a lot of live acting on 60s sitcoms like ‘The Munsters’, ‘F-Troop’ and ‘The Joey Bishop Show’, as well as acting alongside Pamelyn Ferdin (a very familiar face in 60s and 70s TV and movies, as well as the cartoon voice of Lucy Van Pelt in ‘A Boy Named Charlie Brown’) on the late 60s ‘Blondie’ TV series. I have no idea how Robbins ended up making this 45, though it certainly seems likely that someone in Hollywood was trying to springboard off of his fame (this was recorded/released when he was on ‘Blondie’) like they did with tons of other young actors through the 50s, 60s and 70s. 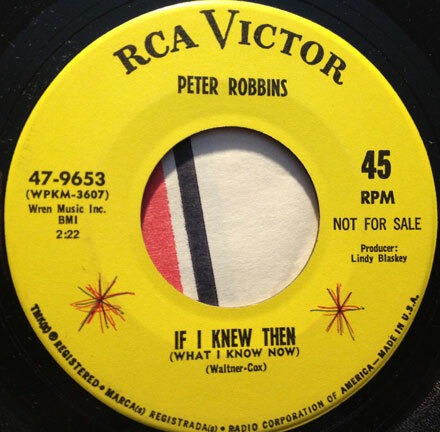 Robbins was only 12 when he made ‘If I Knew Then (What I Know Now)’, which was written by Steve Waltner and Doug Cox. The music is cool in a (very) lite popsike style, at least in the way that pretty much everything at the time was soaking up the musical zeitgeist. Though Robbins has at least one egregious instance of flying way off key, it’s a pretty groovy record. The flipside, ‘Little Brown Mouse’ has just a touch of garage pop to it, which is interesting since the whole thing was produced by none other than New Mexico 60s punk legend Lindy Blasky of Lindy Blasky and the Lavells/‘You Ain’t Tuff’, and producer of ‘We’re Pretty Quick’ by the Chob! Robbins seems to have left acting in the early 70s, later going on to work in talk radio, before mental illness-related run ins with the law landed him in prison in 2015. It’s a interesting little 45 (and story) and I hope you dig it. The record you see before you is one of those things that I picked up so long ago I have no specific memory where it came from. My suspicions are that I picked it up in the pre-interwebs/eBay days, when you had to go out and dig around in record stores, flea markets and such, probably during the peak of my garage obsession in the mid-80s. I can say with some certainty that I grabbed it because of the Soma label, home of the Castaways of ‘Liar Liar’ fame. 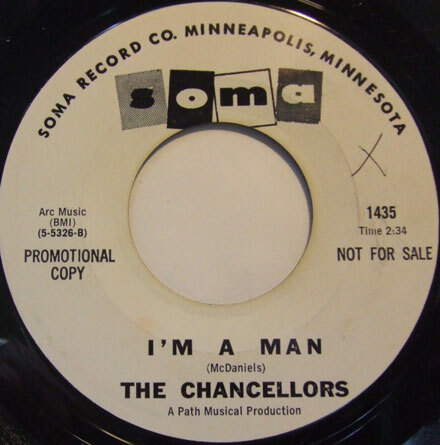 The Chancellors were a local (to the Soma home base of Minnesota) garage band that put out two 45s in 1964/65, right before what we would consider ‘prime garage’ was a thing, but in that sweet spot where all kinds of US-based sounds were starting to enter the UK-beat feedback loop (i.e. US rock bands rediscovering US blues/R&B material that they had heard second/third-hand from English bands) and also starting to whip a little snot into the mix. Some of this, as it was with the Limeys, was white boys (literally BOYS) trying to imitate/emulate middle aged black bluesmen, and I do mean IMITATE, i.e. using their still-cracking adolescent pipes and suburban grammar school diction to approximate the earthy growl of Mississippi Delta gone to Chicago heavies like Muddy Waters and Howlin’ Wolf. 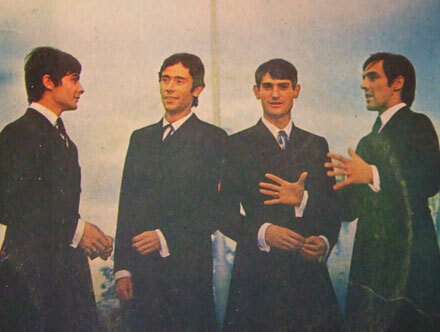 Here we have the Chancellors digging into Bo Diddley’s ‘I’m a Man’. Though the group sounds as if their collective weight wouldn’t balance out against Bo Diddley’s testicles, they have that groovy Seexteez ponk zound, in which they work out the vocal tics over some primitive, Maureen Tucker-esque drums and churning rhythm (almost ALL rhythm) guitars. ‘I’m a Man’ is a pretty basic, deceptively uncomplicated groove that requires a certain level of pounding commitment, and while the Chancellors were never going to make it in Chicago, I’m sure they had the local middle school girlies swooning. Thanks be to the forces of nature that there were so many groups just like them. Dig it, and I’ll see you all next week. International sounds, whether it bet garage, psych, soul or funk, are always a groove to look for/listen to, though I have never had the money or the know-how to dig into them in a big way. As it is with reggae, my connection is usually via an interesting cover version (pr two), which is how I found my way to the 45 you see before you today. The record popped up on a friend’s sale list, and the presence of two groovy covers lured me in. 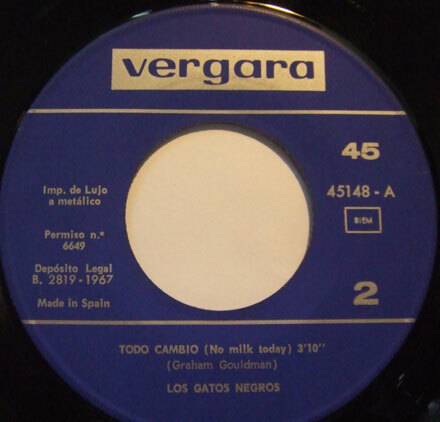 Los Gatos Negros (the Black Cats for the Espanol-impaired) were a Spanish beat group (based in Barcelona) that worked from the late 50s into the early 70s. The discographical info that I have been able to track down seems to indicate that they spent a lot of time re-recording contemporary pop hits for the Spanish-language market. 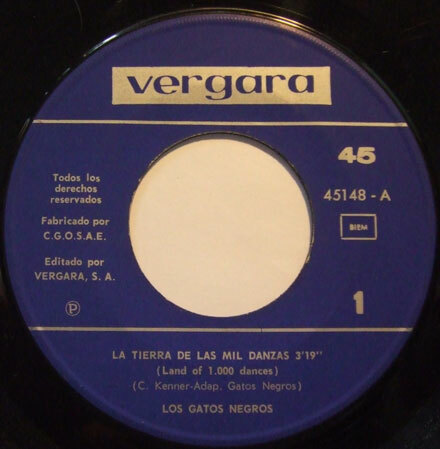 The disc you see before you, containing versions of Chris Kenner’s oft-covered classic ‘Land of 1,000 Dances’ (La Tierra De Las Mil Danzas) and Herman’s Hermits ‘No Milk Today’ (Todo Cambio) was released in 1967. The arrangement of ‘Land of 1,000 Dances’ is pretty cool, with heavy bass and a horn section, and it’s always cool to hear a familiar song in another language (though there doesn’t appear to be a Spanish equivalent for ‘mashed potatoes’). The version of ‘No Milk Today’ (one of my fave Graham Gouldman tunes) hews pretty closely to the Hermits’ OG. All in all, nothing earth-shaking, but a cool record nonetheless. This month I took a dive into the crates and pulled out some winners! 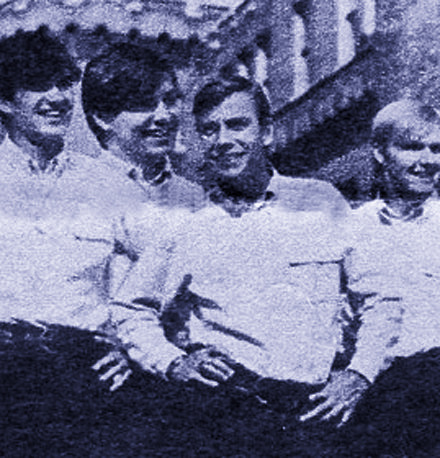 We take an in-depth look at the unjustly obscure (and excellent) album by the Travel Agency, dig some garage, pop and freakbeat (including some early, pre-folkie Cat Stevens) , another long look at the early sounds of the Nitty Gritty Dirt Band, and even a couple of very cool 80s garage/psych things.